Browsing the Sephora website late at night is a dangerous pastime. I’ve talked before about how Too Faced is a brand that tends to skim under my radar… it’s all rather cutesy and whilst I have nothing against cutesy per se… I just never feel quite so inclined to pay good money for ‘cutesy’ as I do for ‘sleek’. Catch 22, I mean I might adore it all right? I think I may finally be forced to indulge this coming Spring (or whenever the hell the UK imports this stuff). I’ve admired the Too Faced Shadow Collections from afar and I think this might be the one that gives me the shove I need to purchase. 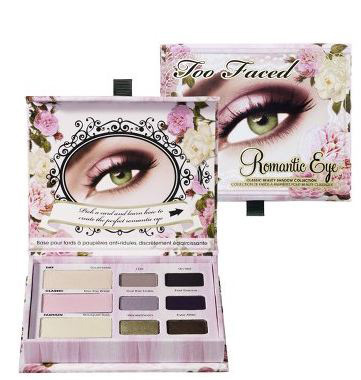 Too Faced Romantic Eye Collection – quite possibly the worst stock image ever. If you go onto Sephora you can use that fancy zoomy picture feature to get a better idea of what the actual shadows look like. A top down view would have been nice though. I’m a sucker for purples and cool toned taupes. In the Summer, I’m a sucker for copper… but Winter/Spring it’s all about these cool-toned shades. I’m also excited to be so delighted by ANYTHING makeup-wise in the Spring. Usually it’s all too pastelly/corally for me. Is a brand finally jumping on the Fyrinnae Pixie Epoxy bandwagon? They Say: This colorless cream formula is designed to grab and hold loose glitters, pigments, and shimmers so they won’t come off until you take them off. I’m not sure when we’re getting this in the UK or how much it will retail at but I’ll guess… around £11 (the same as the original primer). Roughly the same quantity of Pixie Epoxy is cheaper (despite international shipping) but that won’t stop me from comparing especially as the availability of the Fyrinnae website seems to be conspiring against me recently. Either of these two products making you stop in your tracks? I’m intrigued to see if the glitter glue works, as I’ve fallen in love with Barry M’s Dazzle and Glitter Dusts lately. Hope we don’t have to wait too long to see it in the UK! I swear I saw Too Faced in Boots in the Trafford Centre before Christmas? Either that or there is a very similar brand to them.. Replied to this before the web host trauma incident – Penny you did see Two Faced in Boots at the Trafford Centre before Xmas! I was quite keen on the idea of Two Faced palette and went and had a play. Was very disappointed. The shadows were that dry, chalky powder with nasty chunky glitter – possibly ok for 99p if you are under 15, any one more discerning – like all Lipglossing readers! – would be sorely disappointed I suspect so as I said then, you might want to get to see one in the flesh before you order just to see what you think.